Between 1978 and 1996, Congress passed a series of laws that aimed to protect the sovereign rights of American Indians, the religious and other sacred sites and practices of indigenous people, as well as their right to their human remains and objects of cultural patrimony. Assistance to state and local governments, Indian tribes and Native Hawaiian organizations, and the National Trust for Historic Preservation in the United States to expand and accelerate their historic preservation programs and activities. Although almost thirty years have passed since the passage of AIRFA, public resistance to the law continues in the present signaling a continuing the need for public education. A federal policy aimed at protecting a sacred site in Utah withstood another legal challenge on Tuesday. Without comment, the U.S. Supreme Court refused an appeal filed by a conservative group that is fighting protections for several sacred sites. Mountain States Legal Foundation contends the government’s policies violate the rights of non-Indians. In Utah, the group opposed a National Park Service decision to place signs at Rainbow Bridge National Monument discouraging visitors from approaching and walking under Rainbow Bridge. The world’s largest natural bridge is considered sacred by the Hopi, Navajo and other tribes in the Southwest…. After years of battles, tribes have slowly convinced the federal government to be more active in protecting sacred sites located on public lands. In Wyoming, climbing is discouraged at Devils Tower National Monument during Sundance ceremonies. In Nevada, climbing is outright banned at Cave Rock, held sacred by the Washoe Tribe. State governments also have taken a stand. Arizona’s Department of Transportation won’t buy materials mined from a site that is sacred to the Zuni, Hopi and Navajo tribes. As recently as September, the 9th Circuit Court of Appeals rejected Mountain States’ challenge to Arizona’s sacred site policy. From its beginnings, the Park Ethnography Program has had a major role in fulfilling AIRFA federal policy. Regional and Park Ethnographers assist the parks in educating the public about appropriate behavior in relation to American Indian, Eskimo, Aleut, and Native Hawaiian sacred sites, and use and possession of sacred objects. Rainbow Bridge, Rainbow Bridge National Monument, NPS, Utah. As the 1970s came to a close, the National Park Service set out to establish a Native American Relations Policy and mechanisms to facilitate the newly required consultations. These circumstances resulted in the modest beginnings of the NPS Ethnography Program (Crespi 2003). Legal requirements of NHPA, NEPA, and AIRFA were useful in justifying what NPS ethnographers would do and why they would do it, and in identifying the ethnographic processes that would under gird the scope of ethnographers’ practice. NEPA had set into motion development of federally mandated procedures to determine any potential economic, social, public health and safety, and environmental impacts of a wide range of public or private projects, programs and policies. In order to identify impacts, consultation with people on lands often was necessary. Reporting requirements necessitated data-gathering, identifying cultural resources that living people valued, and maintaining inventories of such resources (Crespi 2003). “Ethnographers apply the perspectives and tools of cultural anthropology as they strive to implement NPS mandates to preserve, protect, and allow for public enjoyment of park resources. Using applied anthropology, ethnographers work to enhance public appreciation of the cultural diversity preserved within the National Park system, to facilitate legislatively required consultation with traditionally associated peoples, and to incorporate concerns of park-associated groups into park planning, interpretation, and operations” (National Park Service 2003). NHPA requires consultations whenever properties or neighborhoods are nominated to the National Historic Register. NEPA requires federal agencies to consult community stakeholders when they plan to carry out any action that affects the environment. In order to meet the NHPA and NEPA requirements, the National Park Service through its Planning Division also conducts special resource studies, environmental assessments, and/or rapid ethnographic assessments of regions and locales where preservation and interpretation of their cultural and natural resources are contemplated. Ethnographers in parks and regional offices are called upon to identify who should be consulted, acting as cultural brokers between park planners and diverse cultural groups in the community, and acting as liaisons to other interested publics. As directed by Congress, the National Park Service initiates research such as a special resource study to identify and evaluate alternatives for managing, preserving, and interpreting historic structures, sites, and landscapes, or Rapid Ethnographic Assessment study to examine how people perceive they may be affected by federal preservation efforts. The National Park Service seeks to gain insight about how people involved at a site may wish their cultural heritage to be interpreted. 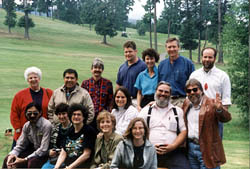 Ethnographers, including American Indian and Alaskan native representatives meet to discuss preservation issues, 1994. In the Cane River area of northwestern Louisiana, the Park Service conducted an environmental assessment with particular emphasis on how Creole culture developed in the area. The Consultation Team included an ethnographer. The Cane River Study included an evaluation of resources for possible inclusion in the national park system using the requirements set forth in the NPS publication Criteria for Parklands, including criteria for national significance, suitability, and feasibility (Crespi 2003). The Southeast regional ethnographer was closely involved in a similar study of Gullah Geechee culture conducted by the Park Service of Low Country, i.e. the Atlantic Coastal plain from North Carolina to Florida. In turn the Regional Ethnographer recommended the planners consult with the ethnographer in the Washington Office who is an expert on African American cultural heritage. Ethnographers in Regional and Washington offices of the Park Service provided technical assistance, advisement, and consultation to NPS planners in the Gullah Geechee Study. All such studies involve consultation with people and communities. Ethnographers may be directly involved or provide oversight to research, prepare scopes of work for contracts, select the contractor, and track the contracted research process. Ethnographers may also work in partnerships with academic researchers through cooperative agreements. Learn more about special resources studies and the involvement of community as well as the role of anthropologist/ethnographers in them. In the 1990s Congress enacted two additional preservation laws: the Native American Graves Protection and Repatriation Act and the Alaska National Interests Lands Conservation Act that helps preserve the cultural patrimony of American Indians and protects the subsistence way of life of rural Alaskan residents, many of whom were indigenous people.